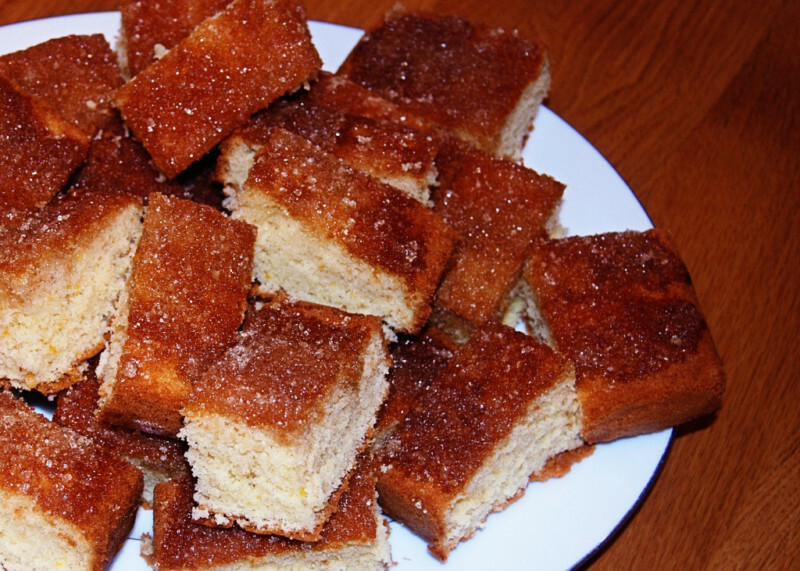 This recipe is a slight adaptation of Mary Berry’s Lemon Drizzle Traybake. These delicious slices will keep for a couple of days in an airtight container. You can find lots of tips for simple, succesful baking in our special featureAll About Baking. Grease a 30 x 23cm baking tin and line the bottom with baking parchment. Wash the lemons and grate the zest. In a large mixing bowl combine the eggs, flour, baking powder, caster sugar, butter, milk and lemon zest using an electric mixer. Pour the mixture into the prepared tin and bake in the oven for 35 minutes or until the cake starts shrinking at the sides and the middle springs back when pressed lightly with your fingertips. TURN OUT Remove the tin from the oven and leave to cool for a few minutes. Then carefully turn the cake on to a wire rack. Peel the parchment off. Squeeze the lemons. Mix the juice with the demerara sugar and pour over the warm cake. Leave the cake to cool completely then cut into 24 slices.